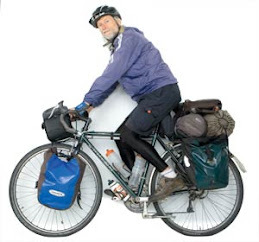 Friends: I've biked over 20,000 miles the past five years following and preparing for The Tour. I've visited every region of this hexagon of a country, crisscrossed its 90 departéments many times, climbed its five mountain ranges, passed through all its major cities, ridden along its many rivers and canals and gorges, and yet I am still regularly awed by a particularly scenic or tranquil stretch such as I biked last night and this morning in the rolling terrain around Montpelier. Not once was there a hint that a bustling metropolis throbbed nearby, a metropolis that on previous occasions had frustrated my efforts for a clean, direct passage through, leaving me happy and relieved to be done with it and not eager in the least to return. I had to contend with an initial surge of traffic exiting Narbonne after the stage finish, the third sprint win by the young English rising star Mark Cavendish, who rides for the American Columbia team. The absence of Tom Boonen, last year's sprint king, has allowed him to become a dominant force at race's end on the flat stages. Today's Stage Thirteen route to Nimes included a most picturesque stretch along the Canal du Midi. Boats were docked bow to stern all along the way awaiting The Tour's arrival. Too bad it comes early in the stage preventing it from being featured on television. I biked once again until dark, gaining 44 miles on the 114 mile stage, camping on the fringe of a vineyard just after the first of the day's three category three climbs, as thickly lined with campers as the Canal du Midi was with boats. The winds have been fierce and gusting the past three days, but mostly from the west, helping me considerably except on those occasions when they have knocked the course markers akilter. One that had been pointing straight up was knocked to the right at a small intersection in a village. Since most hard turns are indicated with a pair of markers I was suspicious. When I didn't see any markers for half a mile I dug out my map and doubled back. The stage's second climb came 22 miles beyond my campsite. About half way up I was slowly passed by a cyclist with triathlon bars who greeted me with a "Bonjour" and "Bravo" with a hint of a non-French accent. He didn't have a small chain ring on his bike and as the going got steeper I caught up with him and discovered that not only was he an English-speaker, but an American, and one of the two Texan brothers, Jesse and C.J., that the couple from Pittsburgh had told me about. I figured I had to run into them eventually. They said one was mostly going by train and carrying his brother's gear for him. They no longer have to worry about trains, as just yesterday they linked up with an Australian with a car who is also biking the course. They saw me pass last night as they were camped along the road. Jesse's brother pulled up along side us a couple of times in the car to offer water and check on his brother. I didn't realize at first he was at the steering wheel, as I hadn't noticed it was a right-hand drive vehicle. I did notice an Australian bumper sticker, leading me to believe at first that they were part of the Australian contingent, which greatly outnumbers the Americans this year. Their first order of business in Nimes was to find the local Decathlon chain sporting goods store to buy a bike rack for the car to accommodate their three bikes. Jesse and I parted five miles from the finish as I stopped to take advantage of a large grocery store, which aren't always easy to find and are generally on the outskirts of French towns. We hope to meet up either at the giant screen or somewhere down the road tonight. They'll be looking for me. Jesse said the Australian, Skippy, has been following The Tour for eleven years and is a great raconteur. He could be just the person I've been hoping to link up with all these years. I'm curious to see if I recognise him. Jesse attended The Tour two years ago and saw three stages, including L'Alpe d'Huez. He's been having knee problems, partially due to his gearing, but also because early on he was pushing it too hard starting each day's route at sunrise forcing him to ride extra hard to reach the finish before the course was closed. Now he does as me and starts riding the course the evening before. He on his unloaded bike forced me to ride extra hard to keep up as we conversed, though I occasionally dropped back for a draft. I pulled into Nimes at 12:30, over an hour earlier than I had hoped, but also feeling leg-weary from having pushed it. Jesse has never done any significant touring. Most of his riding has been training for and riding in triathlons. He rides at a hard training pace rather than touring pace, a style of riding that has done in others I have met up with at The Tour and ridden with elsewhere. It is hard for some to learn to let up a tad when they have to ride such long distances day after day and with weight on their bike. Jesse had news that the young Italian Ricco, wearing the Polka Dot Jersey of the best climber, who has won two stages and ranked ninth overall and was a force to be concerned about in the upcoming three stages in the Alps, tested positive for EPO and was disqualified this morning. I later learned that his entire team withdrew from the race. He's the third rider to test positive this year. The first was former Lance teammate, the Spaniard Manual Beltran. More and more of Lance's teammates have been caught, pointing the finger of suspicion ever more strongly in his face.